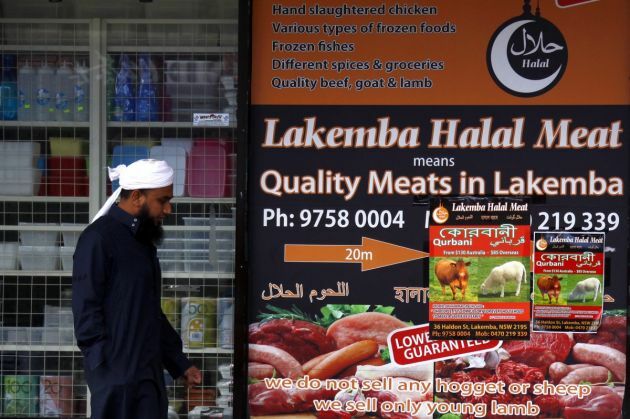 (Photo: REUTERS / David Gray)A man walks past a shop selling 'Halal meat' in the western Sydney suburb of Lakemba September 25, 2014. About half a million people out of Australia's 23.5 million are Muslims, with about half of those living in Sydney's western suburbs. A debate is raging in Australia following a claim made by one of th country's lawmakers that the purchase of products certified as halal could be funding Islamic extremist activity. George Christensen, a Member of Parliament from the National Party of Australia, part of prime minister Tony Abbott's government, claimed that the money from halal certification was funding extremism. Christensen claims were posted in a blog post on his official website. "There is no doubt that halal certification is funding organizations with extremist views and activities in Australia," he wrote. The lawmaker claims that popular Australian brands such as Vegemite and Freddo Frog could be unwittingly funding terrorism in what is seen by Islam followers as anti-Muslim sentiment. And Paul's Iced Coffee has recently faced an online hate campaign because of its halal certification. Australia's ABC News reported that a Facebook campaign has been urging consumers to stop drinking Paul Iced Coffee because it is halal and is being consumed by Muslims. The campaign also implies that income generated from halal certification is used to support Muslim terrorists. The vice-chairman of the Islamic Council of the Northern Territory Sadaruddin Chowdhury said that the Facebook campaign is misguided. Sadaruddin noted that halal certification would increase saleability of products in Muslim countries that do not allow non-halal food to enter their territories. He asserted that funds from selling halal-certified products can be used for any purpose, just like any other business. "Any money can end up with ISIS (Islamic State) if that intention is there by that particular person." Also, the argument of the Facebook campaign that halal certification involves cruelty to animals is baseless as "one of the requirements of halal food is that the animal must be killed in a humane manner and not for pleasure." Recently, South Australian dairy company, Fleurieu Milk and Yoghurt said it would drop its halal certification because of the recent events, NT News reported. They are also dropping a deal with Emirates Airlines. Halal certification is worth a lot to food industries, especially those who want to export products to Islamic countries. The Dubai Chamber of Commerce recently estimated that the halal market could be worth up to $US1.6 trillion by 2018. Senior auditor and meat inspector of Islamic Co-ordinating Council of Victoria, Gaafar A. Mohammed, expresses dismay seeing myths about halal on the internet. "It makes me feel bad because those people are ignorant and talking nonsense. They're trying to destroy the good relationship between Australia and other countries. They're trying to destroy the big volume of trade." Fahim Khondaker, a chartered accountant wrote in the Brisbane Times on December 2, "Australian farmers, the unsung heroes of our economy, are arguably the biggest beneficiaries of independent halal certification. "Our farmers have gained access to new customers in countries such as Indonesia and Malaysia, and the Middle East region thanks to independent certification."